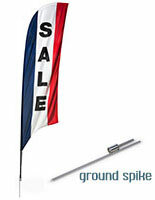 These stock message SALE 13' flag banners are designed for use either indoors or outdoors. 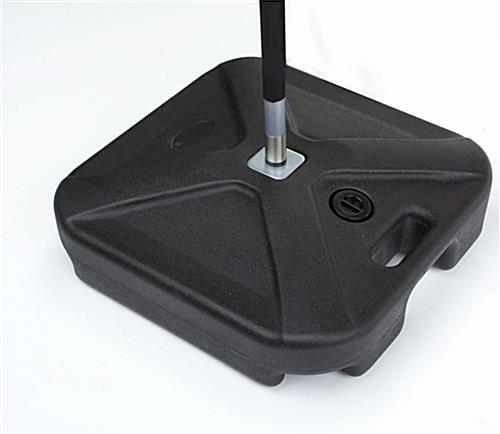 The square plastic base can be easily filled with water to provide stability. 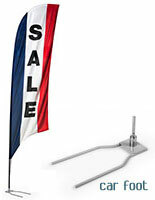 Each of the red, white and blue striped SALE 13' flag banners offers high visibility and alters customers to merchandise and service promotions. 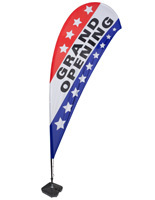 These feather flags are made from durable polyester fabric and will easily withstand winds of up to 20 mph. 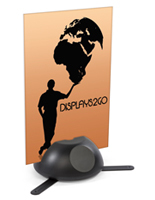 The economical pre-printed 13' flag banners are a high visibility alternative to custom or branded designs. 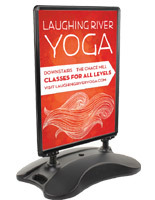 The sectional pole, fabric banner and fillable plastic base are easily assembled and taken down, mkaing these fixtures ideal for everyday or special event/trade show use.